The March For Our Lives this past spring was only the beginning. Five months ago, stepping onto the March For Our Lives stage this past spring in Washington, D.C., 17-year-old Marjory Stoneman Douglas student Delaney Tarr emerged from her four-minute speech as one of the most poised and vocal leaders in the reinvigorated culture war against gun violence. "This is more than just a march," she said at the podium, her cadence picking up. "This is more than just one day, one event. This is a movement. This is a movement reliant on the persistence and passion of its people." Tarr is a survivor of the Feb. 14 shooting at her Florida high school, in which 17 students and teachers were gunned down in only six minutes. "We are not here for breadcrumbs. We are here for real change," she declared. Tarr’s mother, Jen, echoed that spirit, telling ABC News during a March interview that her daughter will "move mountains." Alongside her classmates and other young individuals affected by gun violence, Tarr personified both the fear many students contend with in the post-Columbine era, and the unbridled fearlessness of this youth-led movement born from a massacre. 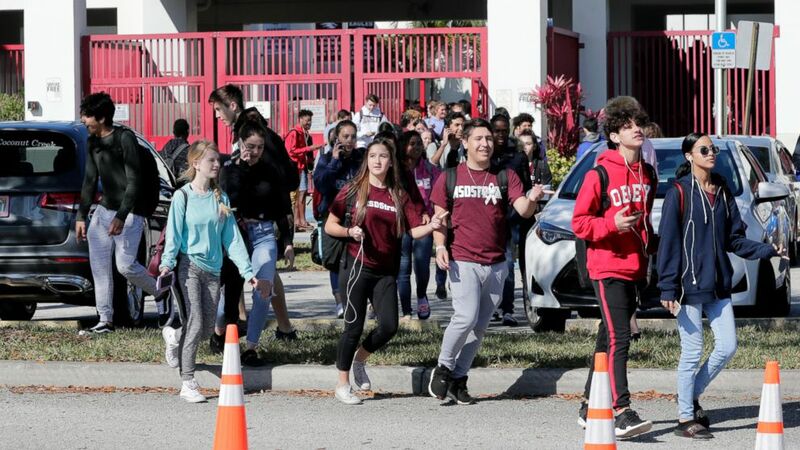 (Lynne Sladky/AP) Students walk out of Marjory Stoneman Douglas High School, as part of a nationwide protest against gun violence, March 14, 2018, in Parkland, Fla. The march may have appeared to be the climax of their fight after a marathon month of rallies, meetings with lawmakers, media interviews and homework in the immediate aftermath of the shooting. The students of Parkland announced in June that they planned to spend the summer crisscrossing America on a national tour, on the March For Our Lives 'Road to Change,' visiting over 80 communities in 24 states in 60 days to register young voters. "We’re teenagers — we are young people who care," Tarr said. "We want [young people] to believe that their voice, their opinion matters." The national tour started in Chicago, sweeping through the Midwest and the deep south of Texas, venturing across California and finishing off in Newtown, Connecticut, the site of the Sandy Hook elementary school shooting. A simultaneous Florida-specific tour traversed every congressional district in the Sunshine State, and continued along the path of the Freedom Riders, crossing through Louisiana, Mississippi and Alabama. 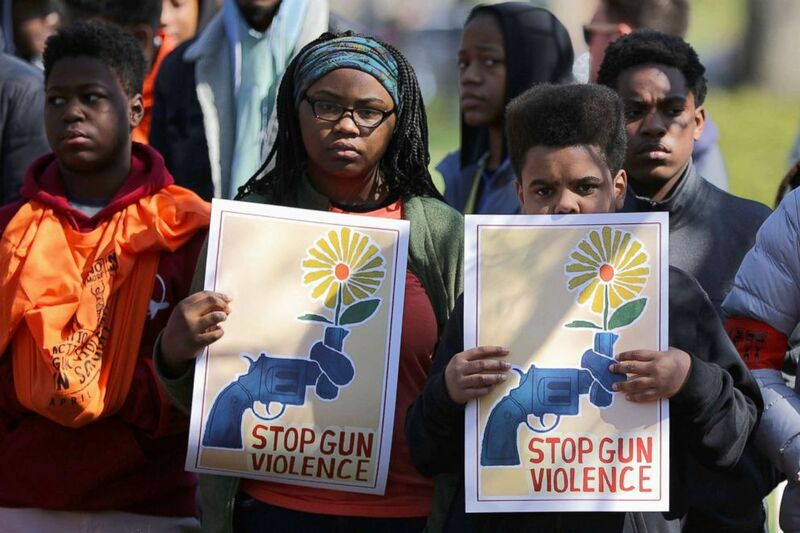 Emulating the Freedom Riders — the 1961 civil rights revolutionaries who came before them — these anti-gun activists strive for an ambitious goal: "Get as many people engaged as possible," Tarr said. "We really wanted to get these communities — just give them a channel to pursue their own activism, to get more engaged," she told ABC News during an interview last week. "It’s easy to make change when you’re doing it every day." Their ambition lies in the fact that only about 20 percent of voters between the ages of 18 and 24 turned out to vote in the last two midterm elections, according to the Pew Research Center. But they are determined to harness the power of young people this cycle by registering, educating and motivating them to vote. "It’s a matter of translating that passion and that fury that a lot of us feel to an actual polling place," she said. "We need to actually push them to vote and be it on gun control or any other issue, we want them to be passionate about it." (Joe Raedle/Getty Images) Delany Tarr (C), a senior, gathers together with some of her fellow students from Marjory Stoneman Douglas High School, where 17 classmates and teachers were killed during a mass shooting, after walking out of school during the National School Walkout, April 20, 2018, in Parkland, Fla. Turning a spark into tangible action — in this case, casting a ballot — hinged on them telling the whole story of gun violence in modern America on the tour. It was not about what happened in their school or about any one student, according to Tarr. Instead, the 'Road to Change' embedded local teenagers from different pockets of America along every stop to lift those native voices onto Parkland’s national platform and show the impact of gun violence in all its forms. "It’s not anything about what I did, or what I went through ... it’s how many other people there were doing such incredible things because it was not a summer about us," Tarr said. "The only way that we can truly be inclusive and truly be whole in our fight to end gun violence is to show every single perspective, every single story. We did that by uplifting their voices." The Florida tour's evocation of the Freedom Riders of the civil rights movement was not only in the choice of route, but also in the use of peaceful events — town halls and roundtable discussions — to confront their opposition. During one of the first roundtables in Naples, Florida, a counter-protester asked why they wanted to take guns away from women who are using them for self-defense. Tarr said this "misconception" (the group has repeatedly said it is not against the Second Amendment and supports responsible gun ownership) led to common ground between the two. The march members on the tour reiterated that they only want to take guns away from people who would try to harm a woman — something they all can agree on. These moments on the tour, for Tarr, were "one of the most powerful things that we could do." "If you’re not exposed to that opposing side, you really you don’t see how to make your arguments better, how to make your policies better, and how to really just engage more people," she asserted. "For us, it was a way of teaching us how to become more thorough and how to become better at what we did and what we continue to do." 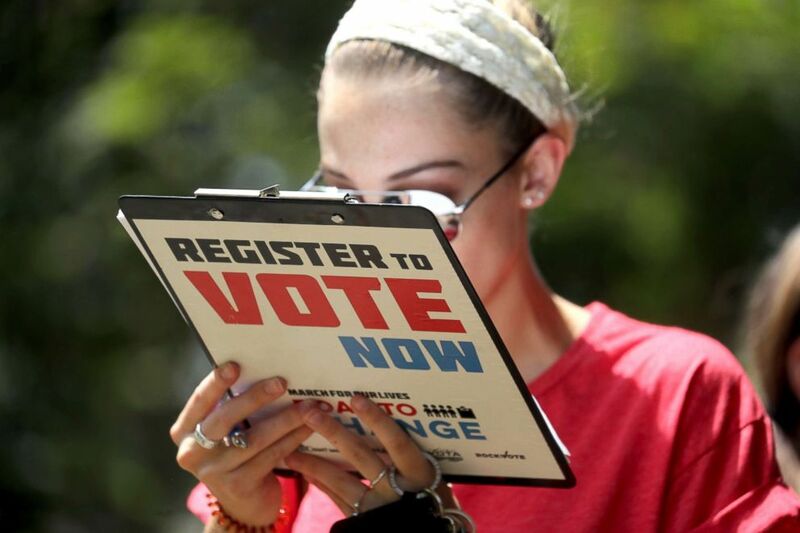 (Mike Stocker/South Florida Sun-Sentinel via AP) Chloe Weiland registers to vote during the Road to Change bus tour, July 28, 2018, in Tallahassee, Fla. Students and supporters from the March for Our Lives movement gathered as the Road to Change bus tour met in Tallahassee for a rally to gather support and register voters. Returning to Florida from the summer trek across the country, the group appears more self-aware, boasting a stronger, more inclusive movement heading into the state’s primary and November’s general elections. The first test for Parkland’s crop of teenage activists will be Tuesday’s primary elections in their home state. Turnout among the youngest demographic in Florida could be a key barometer of their success in the fall. The number of total voters who already cast ballots for the primaries surpassed one million as of Aug. 28, with over 1.2 million voting by mail, and 661,891 voting early, according to Florida Division of Elections. This cycle is seeing a more energized electorate, but for young voters, they will have to overcome historically dismal participation, particularly in midterm elections, for turnout rates to significantly rise. "All indications that we are going to have an usually high turnout at least in recent years," Michael McDonald, a political scientist from the University of Florida, said of this cycle. "If we are going to see higher turnout, it will come disproportionately from younger voters." "They are more activated," he added, but warning, "we’re starting from a low point of interest." Now 18 and of voting age, Tarr will be among that keenly watched demographic, as she casts a ballot for the first time. But her vote, as she suggests, carries far more than just her voice, but the weight of 17 lives. "I’m not just voting for myself, but I’m voting on behalf of 17 other people," she affirmed. "I’m voting on behalf of every student at my school, every person in this country that can become a victim of gun violence, that has become a victim of gun violence. I’m voting for people’s lives." One thing is clear: This pack of trailblazers that includes Tarr and her classmates David Hogg, Emma González, Ryan Deitsch, Jaclyn Corin and Alex Wind aren’t going anywhere, with several delaying college to focus their efforts on November. Tarr deferred her first semester at the University of Georgia until January 2019 because she said, "To be in college at a time that is so pivotal and so key to the March, to democracy, to everything felt wrong, it felt a little bit selfish." It’s been five months since the historic march on Washington, and amidst seething political divisions, the March For Our Lives members are both graduates and soon-to-be first-time voters, and much like its members, the movement itself is evolving — evidenced by a broader message extending beyond ending gun violence to one of equality and an equal right to life. (Chip Somodevilla/Getty Images) Several hundred high school students from the Washington area observe 19 minutes of silence while rallying in front of the White House before marching to the U.S. Capitol to protest against the National Rifle Association and to call for stricter gun laws, April 20, 2018, in Washington, DC. "When it comes to everything, be it race, be it our lives, we’re just fighting for equality," Tarr said. "I think that was something that resonated with a lot of us and it definitely resonated with the places that we went to." More tenacious than ever, the group's next phase of activism will be an extension of the "Road to Change," according to Tarr, as the group aims to impel the young voting bloc to show up at the polls come Election Day. "The next step is continuing to engage with people on a more local level," she said "A lot it is about providing that guidance, that communication channel, so that we can really be more successful, better equipped to handle things in the long run." "Because we are so powerful, we’ve just been told that we aren’t for so long," she added.